As George Washington had anticipated, British forces under General William Howe departed from Halifax in the late spring of 1776 and headed for New York City. They entered the harbor in late June and on July 2 established headquarters on Staten Island. Ten days later, Admiral Lord Richard Howe arrived with additional forces. Over a period of several weeks the British army grew to about 32,000 men, including more than 8,000 mercenaries hired for service in America. Washington had moved the Continental Army from Boston following the British evacuation. He realized that New York City would be difficult to defend, but its strategic and symbolic importance dictated that the effort be made. 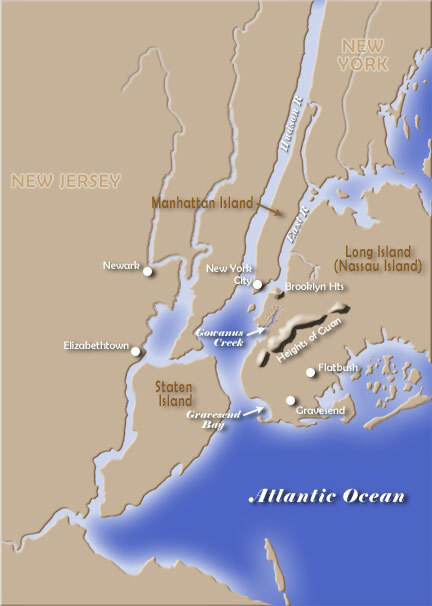 Fortifications were erected around the city, which was then confined to the southern tip of Manhattan, as well as on the Brooklyn Heights area of Long Island to the east of the city. The Americans were unsure of where the British would choose to strike first. Beginning on August 22, the British plan began to become clear. Soldiers were transported from Staten Island to Long Island by way of Gravesend Bay. Meanwhile, on the waters off New York City, Lord Howe exchanged fire with American batteries on Manhattan. Within a few days, 20,000 British soldiers congregated in the vicinity of the village of Flatbush. The American army of 10,000 was deployed in a series of fortified positions on Brooklyn Heights and spread across the surrounding Heights of Guan. Several skirmishes occurred between small bands of the opposing forces over the following days. On the night of August 26, British forces under General Howe were able to take advantage of intelligence provided by local Loyalists, who identified an undefended pass leading up to the Heights of Guan. Under the cover of darkness British soldiers managed to gain a position between American forces on Guan and the main force on Brooklyn Heights. In the daylight of the 27th the British opened fire on astonished Americans, who quickly recognized their dire situation. Soldiers under John Sullivan of New Hampshire broke and ran. Fellow American commander William Alexander of Pennsylvania, known as Lord Stirling because of his claim to a Scottish title, fought effectively for a while, but was slowly encircled by numerically superior British forces. It was evident that disaster could be averted only by retreating down the hill and across the swamplands by Gowanus Creek. Such a move, however, would expose the Americans to deadly fire from the British in the hills above. To provide cover for the retreat, Alexander and Major Mordecai Gist led a band of 250 Marylanders on a direct assault against the British lines. The Americans broke under withering fire, but regrouped and bought sufficient time to allow the bulk of the army to flee, often throwing arms aside, to Brooklyn Heights. Only a handful of the Marylanders were able to escape. Alexander was eventually surrounded and he surrendered, and Sullivan was captured. The Americans listed about 1,400 casualties from the Battle of Long Island. The British toll numbered fewer than 400. This embarrassing display was observed by a helpless Washington from atop Brooklyn Heights. For the next two days, he and his army expected a British assault, an event that would most likely had led to a decisive British victory. During this period of quiet, the weather was unseasonably cold and a steady rain fell; American morale was at a low point and many soldiers talked of surrender. On the advice of his subordinates, Washington took advantage of British inaction and planned a retreat to Manhattan. British control of the harbor and rivers made this a risky prospect. Nevertheless, on the evening of August 29, the American army was ferried across the East River in a flotilla of small craft provided by sympathetic civilians. The retreat was aided immensely by calm waters that enabled the overloaded boats to make the crossing safely and by thick fog in the early hours of the next day that masked the departure of the last soldiers  which included a somber Washington. The question remains about why the British did not use their superiority on land and sea to strike a potentially lethal blow against the Patriot cause. Most historians agree that William Howe chose not to assault Brooklyn Heights because of his earlier experience at Bunker Hill where he also commanded an overwhelming force, but suffered extremely heavy losses. The general decided instead to set up a siege, believing that time was on his side. The failure of his brother, Admiral Howe, to halt the retreat across the East River has been ascribed to unfavorable winds that prevented his ships from destroying the tiny American flotilla and its human cargo. More recent historians, however, have argued that no ill wind was blowing at the time and that the admiral, a friend of America, was hoping to conclude affairs with a peace settlement, not a military victory to conclude the Battle of Long Island. Battle of Long Island The Battle of Long Island. Having lost Boston, the British were determined to take control of New York. ... Battle of Long Island. ... Mantle Ministries | Presentations | Battle of Long Island ( ... ... BaBattle of Long Island The Battle of Long Island. Having lost Boston, the British were determined to take control of New York. ... Battle of Long Island. ... Mantle Ministries | Presentations | Battle of Long Island ( ... ... BaBattle of Long Island. Having lost Boston, the British were determined to take control of New York. ... Battle of Long Island. ... Mantle Ministries | Presentations | Battle of Long Island ( ... ... BaBattle of Long Island. ... Mantle Ministries | Presentations | Battle of Long Island ( ... ... BaBattle of Long Island ( ... ... Battle of Long IslandBattle of Long Island.